A man has been charged with plotting to kidnap and kill a UK soldier, following last week's anti-terror raids. Parviz Khan, 36, is accused of devising the plot between 1 November last year and his arrest on 31 January. He also faces charges, along with four others, of supplying equipment and funding for a terrorist act. The five men, who were arrested during a police operation in Birmingham, will appear before City of Westminster magistrates in London shortly. Of nine men arrested in the raids, three have been released without charge and another remains in custody in Coventry. 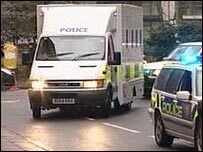 The five have all been charged with offences under the Terrorism Act 2006 and the Terrorism Act 2000. Amjad Mahmood, 31, Mohammed Irfan, 30, Zahoor Iqbal, 29, Hamid Elasmar, 43, and Mr Khan have been charged with supplying equipment and funding for a terrorist act between 30 March last year and their arrest. Mr Mahmood faces an additional charge of failing to disclose information of material assistance in preventing an act of terrorism. 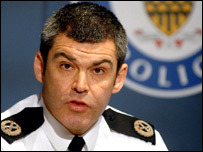 Assistant Chief Constable David Shaw, of West Midlands Police, told a news conference some documents and equipment still had to be examined. "Nine days ago I told you that we were at the foothills of a major investigation," he said. "We have made extraordinary progress in that time but it would be wrong of me to leave you thinking that this was in any sense a completed inquiry. "To date we have seized over 4,500 exhibits which includes computers, mobile phones and many documents. "Many of these have yet to be examined and it's going to require many hours of analysis." On Thursday, Abu Bakr, one of those released without charge, spoke out over his arrest. Mr Bakr, who works in the Maktabah bookshop, targeted in the raids, told BBC News the UK was "a police state for Muslims". Dr Mohammed Naseem, chairman of Birmingham's Central Mosque, said Muslims felt "persecuted unjustly" by the government for political ends. He said some in the community resented the way the raids were carried out and opposed laws allowing terror suspects to be held for up to 28 days without charge. But ACC Shaw told Friday's news conference: "It is important to highlight that we have had overwhelming support from local people about the way our officers have conducted themselves throughout this investigation. "You will be aware that three men have been released without charge during this investigation. "Contact officers have been appointed to all the families throughout this investigation and will remain in close contact in the coming weeks and months to support the families. "Community cohesion is at the heart of our what West Midlands Police does and we will continue to nurture the relationships we have and listen to the concerns of all our communities." The British Muslim Forum has appealed for restraint from the media following the charges against the five men. Chairman Khurshid Ahmed said: "The due process of law must be allowed to take its course without interference from the media." He also urged imams across the country to use the Friday sermon in mosques to appeal for calm. Police have until 0400 GMT on Saturday to interview the man who remains in custody.